View of Scio Anciently Called Chios, One of the Most Celebrated Cities in the Archipelago. The publisher and engraver are unknown. c. 1790. 6.75 inches x 4.5 inches. A view of the side of the bough pot. 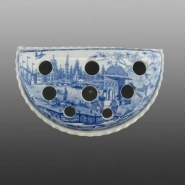 It was a common practice not to print on the back of bough pots because they were typically placed on a mantle or sideboard and the backs would not be seen. A view from the top of the pot. It was customary in English homes to arrange flowers and branches in the hearth during the summer months when the fireplace was not in use. Bough pots were used for these arrangements. 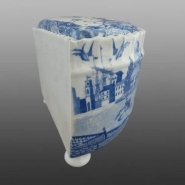 An earthenware bough pot printed in blue with the Eastern Port pattern. Though unmarked, a similar example has been found with the impressed lower case Ridgway. The border design consists of crowns flanked by thistles and roses, representing Scotland and England. The domed building is actually a fountain. The pattern was inspired by an engraved print titled View of Scio Anciently Called Chios, One of the Most Celebrated Cities in the Archipelago (see below).